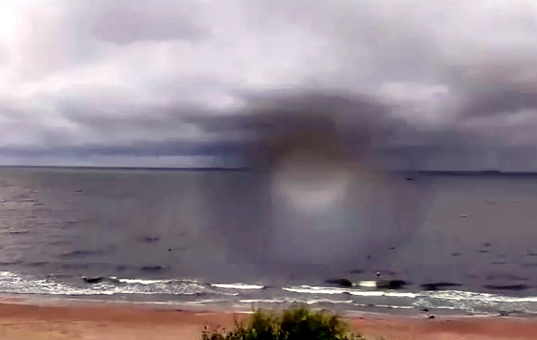 UFO SIGHTINGS DAILY: UFO Appears at Beach On Live Cam In Poland During Sunset! Aug 16, 2016, Video, UFO Sighting News. UFO Appears at Beach On Live Cam In Poland During Sunset! Aug 16, 2016, Video, UFO Sighting News. Guys, live internet cams are an untapped tool that needs more focus by UFO researchers. Live cams let you be in thousands of places with just glimpse. This UFO was cloaked but seen during sunset on cam due to the suns angle of setting. Amazing catch. I enhanced the natural colors of the photo to make it stand out more. Most UFOs do originate from underwater bases...its just logic guys, since 75% of Earth is covered in water. Hi All, Some more Huge Objects near the Sun at Sunrise in Europe.. Concentrated on thew weird UFO Disk Shaped objct in the Sopot, Poland Skyline Webcam & the Nea Roda Chalkidiki Skyline Webcams for this series of images & videos. A section of the videos has been sped up for time value.. Most of the h=Highlights are the single to a few multiple images between the Video Segments.